One of the subtle (but overdue) changes in Android 4.4 Kit Kat pertains to the way fullscreen applications work. Before Kit Kat, if an application took up the entire smartphone or tablet screen, the only way to access notifications was to exit or pause the application by navigating to either (1) a different app, or (2) the launcher. This quickly became frustrating. Android 4.4’s “immersive mode” rectifies the issue by allowing users to recall the notification shade (and on-screen navigation key, in the absence of hardware buttons) by swiping downwards from their respective device’s top bezel. The improved behavior is incredibly sick, but the scope of its adoption obviously depends on developers. 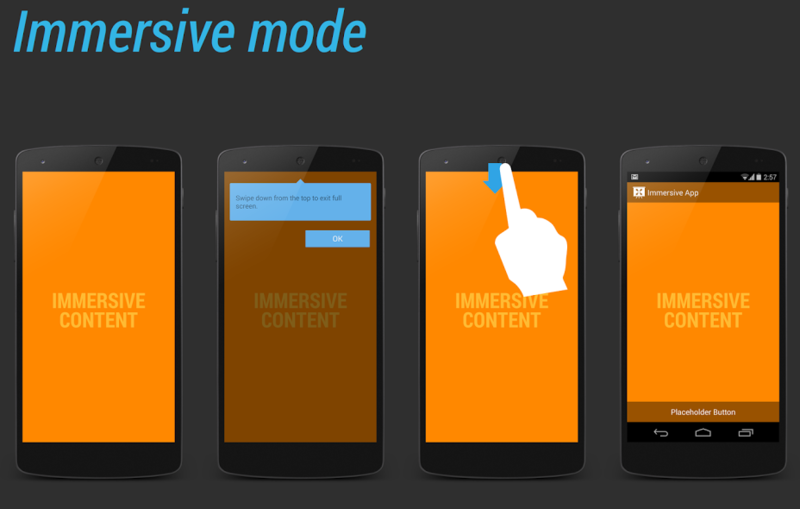 Luckily, nearly 50 days after Kit Kat’s introduction, some have begun to implement immersive mode into their applications, like RSS reader Press and game studio Vector Unit (Riptide GP2 and Beach Buggy Blitz). Developers typically make these types of changes through app updates, though, so it’s tough to track which apps take advantage of the feature. To remedy that, we’re compiling from a number of sources (including this Reddit thread) a list of apps and games that support immersive mode. This list isn’t intended to be holistic, but it should provide a good starting point for those looking to see immersive mode in action. Still, let us know in the comments if we missed anything major.